Please note that the volunteer submission form is closed, as we already have enough volunteers for this year. Thanks so much for your interest! The 5th Annual FoCoMX will feature more than 240 bands at 24 venues over 2 days on April 19th and 20th. 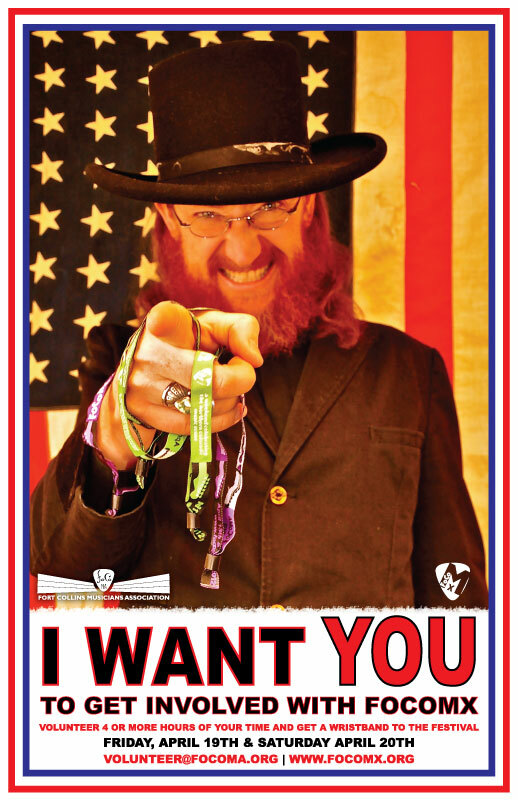 Benefits of volunteering include free admission to the festival (if you work four or more hours), access to great music, and the pride of knowing you personally played a vital role in one of the greatest local music festivals the world has ever seen! and an awesome T-shirt! If you're volunteering for this year's FoCoMX Festival, we ask that you attend one of the below volunteer orientations. Orientation should take less than an hour and will include information regarding your shifts, roles, responsibilities, etc. Orientations will be held at the FoCoMA Offices located directly next to KRFC. The street address is 619 S College Ave #5. If you'd like to get involved, please submit the form below. After submitting the form you will receive an email or phone call so you can get signed up for your volunteer shift.